One bundle of joy is special - baby boy twins are even better! 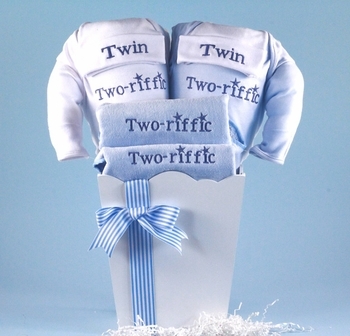 These artfully designed pair of adorable matched outfits for twin baby boys will be greatly appreciated by any family blessed with two new arrivals. All these are of the highest quality and manufactured right here in America. For that special touch, this gift ensemble is decoratively presented and wrapped in a wooden pail useful for any nursery. See More Images above for a close-up picture of this product.